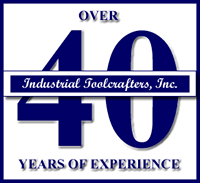 Industrial Toolcrafters, Inc. is one of the most dependable and versatile tool & die corporations in the state of Wisconsin. Modernized machinery, an internal communication network, and a wide variety of CAD software sets us above the competition. With over 40 years of experience, we can assure DEPENDABILITY, QUALITY, and ACCURACY in all of our work. The navigation buttons to the left provide a more detailed look inside Industrial Toolcrafters, Inc. From an overall description of the company, to a photo tour of the facility, completed projects, to a brief history; this website will better acquaint you with our services. If you wish to contact us for more information by email or by phone, please click on the Contact Us link.